You are currently browsing the tag archive for the ‘China Miéville’ tag. China Miéville is an English writer of (urban) fantasy/sci-fi/ steampunk and a professor of Creative Writing at the University of Warwick, UK. He is the one who coined the phrase ‘weird fiction’ in literary discourse, primarily to describe his own works, but also in relation to other writers who influenced him (H.P. Lovecraft, Algernon Blackwood, Arthur Machen etc.). He claims that the term ‘weird fiction’ can be applied to all literary works which cannot easily fit into just one niche category (such as horror, sci-fi, or fantasy) but make use of many elements from many categories instead. 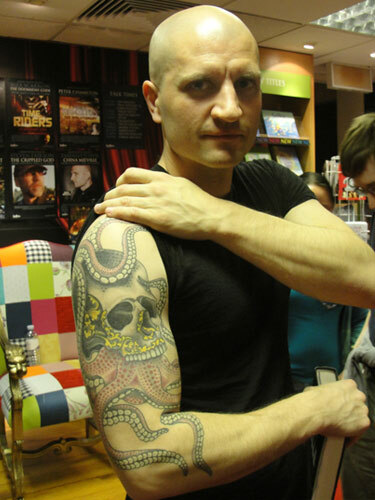 Miéville has won several awards for several of his novels: he won the Arthur C. Clarke Award for sci-fi three times, the British Fantasy Award twice, the Locus Award for sci-fi and fantasy three times and the Hugo Award for sci-fi twice. This year, he has been shortlisted for the fourth time for the Arthur C. Clarke Award for his Kantian sci-fi novel, Embassytown. Miéville is also one of the most prolific niche authors of the last decade, with currently eight published novels (Perdido Street Station, The Scar, Iron Council, King Rat, Un Lun Dun, The City & the City, Kraken, Embassytown), one collection of short stories (Looking for Jake and Other Stories) and another novel announced for publication in May 2012 (Railsea). Given that China Miéville is such a prolific author, and given that each of his novels is written in a different style using a different mix of elements, deciding which of his books to review proved quite a difficult task. But in the end, we turned our attention onto his next to latest book, Kraken: an Anatomy, which strays away from the dark steampunk setting of his Bas-Lag trilogy (Perdido Street Station, The Scar, Iron Council), as well as from the outlandish atmosphere of The City & the City. Kraken is an unusual mix of urban fantasy, crime fiction and Lovecraftian horror, focusing on the strange and improbable disappearance of a giant specimen of squid from the inner sanctum of the Darwin Centre of the British Museum of Natural History in modern-day London. The protagonist, Billy Harrow, curator at the Darwin Centre, is suddenly faced with the unbelievable reality of a hidden London after the disappearance of the specimen which he used to take special care of. Thus, Billy unwittingly stumbles into a city torn between religious sects which agree on nothing but a single fact: that not one, but several different apocalypses are about to erase London off the face of the earth – unless the giant squid is found and brought back. Billy finds himself kidnapped, by turns, by the Church of Kraken Almighty – which claim Billy as their Messiah – by the fearsome Tattoo and his gang – a band of villains with gruesome powers who care for nothing but supremacy over London – and chased by the special brigade of the London police – the one which employs officers with ‘knacks’, special powers that allow them to bend bits and pieces in the structure of the universe and converse with ambiguous spirits from beyond. As, day by day, London becomes more unstable, more dangerous, and less familiar, Billy eventually has to accept that something terrible might, indeed, be about to happen, and in order to stop it he must find out who and why has stolen the fifty foot squid reminiscent of the archaic threat of the kraken. In his improbable quest, he gets to ask the advice the of the Londonmancers – modern-day druids and prophets who can read the bric-a-brac of the city for signs – and to accept the bewildering help of the terrible and mysterious Angel of the Darwin Centre. Miéville’s novel is thus a fascinating mixture of the realistic and the improbable, the gruesome and the miraculous – all carefully balanced for suspense and wittily sprinkled with a healthy dose of humour and irony here and there. Kraken is a compelling read, thrilling and surprising every step of the way. In his story, Miéville has taken all the traditional concepts – of witches, mythical beasts, warlocks and familiars – and has transformed them into something utterly new, 100% compatible with the setting of modern-day London, buzzing with life and enriched by technology. 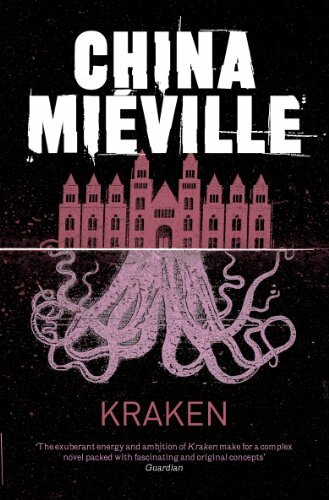 Has any one of you read Kraken, or any other books by China Miéville before? What did you think? Did you enjoy his ‘weird fiction’? If you haven’t read anything by him before now, would be willing to try? As always, you can find China Miéville’s books at Nautilus, and we are looking forward to your feedback!